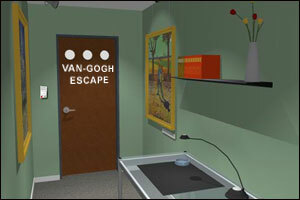 Van-Gogh Escape is the second Room Escape game created by French developer, Fredo. The game features a room with a few paintings of famous Dutch Post-Impressionist painter Vincent Van-Gogh. That being said, navigation is not always intuitive, but with it’s nice graphics, Van-Gogh Escape is a must try! Is there any way to enter the Lounge room? I’ve found 2 filters that I assume go on the spot lights. I don’t think you can enter the lounge, I’m guessing you were stuck there in the first game? but I have no idea how to use the items. Got #2 from haystack picture and #6 from bedroom picture. Out. Gotta love those Roman numerals. I’m out too. I saw the clue from the books about the order and the Roman numerals, but didn’t want to go to all the trouble. So just used trial and error with the 4 digit code and got out on the 4th try. That was short and easy! Turn right. Click the circle at the top left corner of the painting. You get the yellow lens. Turn left and click at the middle of the screen twice to proceed to the rest of the room. Click on the office. Get the lens from the top of the lamp and the ashtray. Examine the ashtray to get the third lens from its bottom. Turn left in order to face the door. Notice a little black spot at its left, right over the white line. Click the left white line in order to get the last lens. Now let’s get the code for the door. If you examine the books over the desk you’ll see a simple diagram about the order of the paintings. So, I copied and pasted the address(same one) and it opened. I would cut off my ear to play more games like this! How the hell is that symbol a 4???!!! There’s no dots in a 4 <<<<< see?? Posted on Monday, November 16th, 2009. Follow any responses through the RSS 2.0 feed.